In the early 1990’s SweetOz (formerly Kiss Chocolates) became aware of the need for a smaller than the normal chocolate bar line which was at the time 45gm. There appeared to be a gap in the market for a high quality chocolate product about 25gm or 75 cents retail, that would appeal to the Australian taste buds. At first the chocolates were hand molded which, even working seven days a week made it difficult to keep up with demand. Within 12 months we could not keep up with demand, a pallet of chocolates would take a week to make. This left little or no time to do the sales and marketing that was required to grow the business, so it was decided to “out-source” the production. 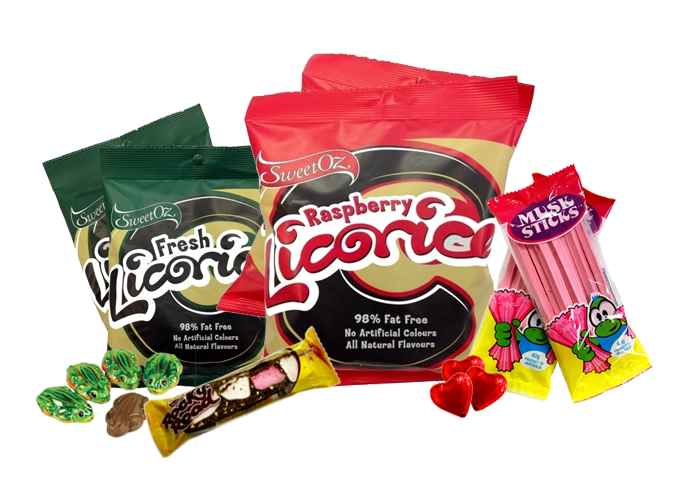 Within a short period we found an Australian manufacturer of top quality chocolates and then redesigned the products to be re-launched into the Australian market. At first the chocolates were unwrapped and we soon developed a strong following of customers that appreciated quality Australian chocolates. In 1997 the Company decided to register the name we had established, “Kiss Chocolates,’ and to everyone’s amazement, we were challenged by the multi-nation confectionery giant Hershey’s. Hershey’s had a product called Hershey’s Kisses and believed they had the right to anything that was branded “Kiss’, even though many other companies had and still do use that name. After a lengthy and expensive legal battle that a small Australian Business such as ours would never win against a huge international company, we cut our losses and renamed the business SweetOz. This led to the rebranding of all of our products to SweetOz with our top ranges also carrying the banner of SweetOz Gold that is so strong today. One thing is for sure, “You’ll never forget your first KISS”. By 2001 the product range had grown to eight varieties, each chocolate was twist wrapped and in outers of 24 pieces; we could now start marketing our product all over the country. “The name change meant we went through a re-branding of our logo and packaging, the process was costly but looking back a very worthwhile process. The SweetOz distribution system was mainly through the wholesale network and two trucks in our home city of Melbourne. We then increased our product range and customer base to such a point that we needed to change some of our distribution mix, and in order to grow further we appointed independent agents in Queensland and New South Wales. Our distribution grew at a very fast rate and quickly grew into a national distribution network, that provided first class service and quality Australian chocolates that were not previously available in the market place. The acceptance of the product by the Australian consumer quickly help build the brand into a very strong, recognisable and thoroughly enjoyable Australian made chocolate. With refrigerated vans in all states of Australia, owned or under our control we are able to service and supply major wholesalers in Australia with a direct customer base of over 4500. This allowed SweetOz Distribution to offer our customers a “direct sales representative” with fully stocked vans of delectable chocolates. Today SweetOz has a range of chocolates which they believe is unequalled by any other small Aussie Chocolate company and a distribution system that is the envy of all our competitors. Service to our customers is of the utmost importance to us which is why we only employ highly motivated sales people who can focus on the needs of our customers and deliver great service. SweetOz is a very progressive company which is always looking for new, unique and exciting chocolate products to launch into the market place which generate more sales, profits and cash for our customers. Today our company continues to grow by increasing the distribution into non traditional markets and by being first onto the market with new, innovative and different products. SweetOz is 100% Australian owned and operated utilising 100% Australian manufacturers to ensure that we have first class quality control and always supplying the market place a product second to none in the country. We hope you get the opportunity to taste and enjoy our range of chocolates that so many other satisfied customers have and continue to do so, and we thank each and every one of our customers who continue to support our Aussie business.